West Michigan is committed to multiculturalism, inclusion, and cultural competency, not just in the workplace, but in our communities and neighborhoods. You’ll find more than 40 languages spoken here, and our students represent more than 53 countries of origin. Grand Valley State University’s Diversity Resource Offices serve faculty, staff, students, and the community through its Inclusion and Equity Office, Disability Support Services, LGBT Resource Center, Office of Multicultural Affairs, Padnos International Center, and Women’s Center. The Hispanic Center of West Michigan serves as a resource for the Hispanic and broader community throughout the region. The Lakeshore Ethnic Diversity Alliance seeks to dismantle racial, socioeconomic, and institutional barriers to ensure that people of all ethnic backgrounds have equal access and opportunity to participate fully in the life of the community in Grand Haven. The West Michigan Chamber Coalition publishes a guide to women and minority owned businesses in the area. Grand Rapids offers a wealth of diversity resources. The Asian Center’s mission is to achieve a diversified, caring, just, and democratic global community by assisting individuals, families, groups, and communities to improve the conditions and meet the needs through self and collective actualization. 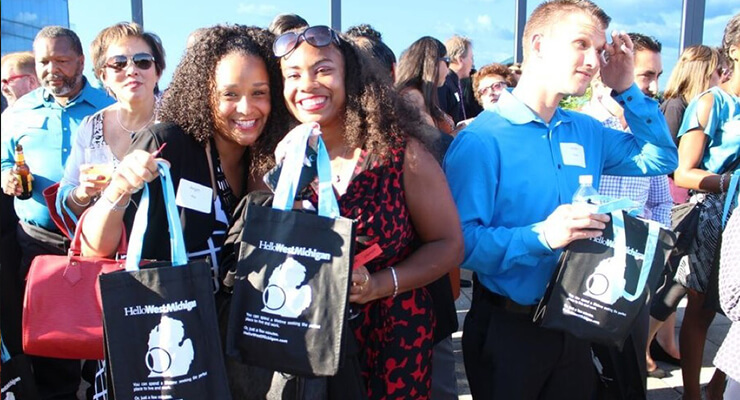 BL²END serves as an outlet for young professionals of color to learn, network, grow and become engaged in the Grand Rapids community. Nottawaseppi Huron Band of the Potawatomi is a federally recognized tribal government. The Grand Rapids Pride Center empowers the LGBTQ community through supportive services and awareness. The Grand Rapids Area Chamber of Commerce is known for its leadership in the area of diversity initiatives and programming including the Institute for Healing Racism. Black Women Connect GR is an affinity group run by the Grand Rapids Area Chamber of Commerce. Greater Grand Rapids Chapter of Jack and Jill of America is a local organization for all African American children that provides enriching experiences through active participation in civic, social, educational, cultural, and personal development to support the successful attainment of their goals, ambitions, and aspirations. Grand Rapids Sister Cities International is a non-profit organization interested in coordinating, promoting and expanding international relationships and activities in the areas of trade, culture, and education. The Literacy Center of West Michigan works alongside adults, both native speakers of English and English language learners, who read below the 9th grade level and want to improve their literacy. 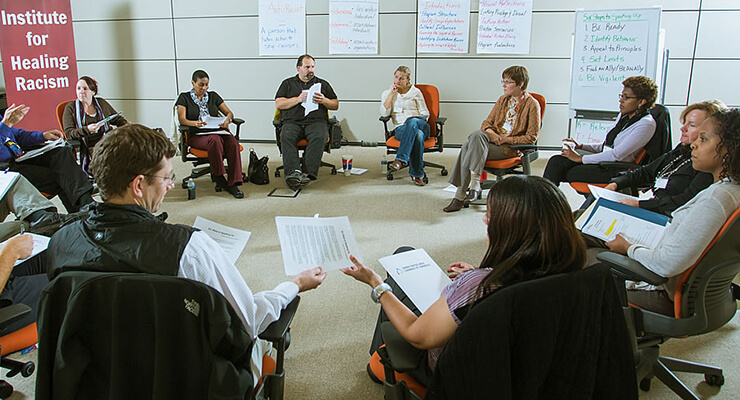 The organization meets adult learners where they are, providing workplace-focused classes, family literacy programming, and one-on-one tutoring all at no cost to the learner. Western Michigan Bengali Association is a non-profit organization formed by “Bengalis” (community from eastern India) who live in West Michigan. The organization aims to create awareness about the rich cultural heritage of India amongst the larger community, help integrate members of the South East Asian communities to the area by providing a local platform to celebrate Bengali festivals and events. The Grand Rapids Urban League is dedicated to delivering services and creating systemic changes that eliminate racism and increase the availability of quality life chances. The Kent ISD Diversity Initiative focuses on healing racism to improve student achievement by supporting and initiating leadership/coordination for county-wide efforts, educational opportunities and communication. The League of Women Voters – Grand Rapids works with and for the Grand Rapids community to discover the power of voting and the potential for change through civic participation. The Michigan Black Expo, Inc. is a non-profit social change conglomerate of Africentric events, products and services. The Grand Rapids’ branch of the NAACP may be reached at (616)243-1000. The Grand Rapids Pride Center serves the LGBT communities of Western Michigan through networking, referrals, and resources. Partners for a Racism-Free Community is a movement of committed citizens and organizations working to move Greater Grand Rapids from “that’s the way it is” to “racism-free” through personal commitments, institutional efforts, social advocacy, and persistent intolerance of racist attitudes, words and behaviors. The Philippine-American Association of Southwest Michigan (PAASM) is dedicated to maintaining, preserving, and cultivating Filipino culture and heritage, and helping others to share the same goals. The West Michigan Minority Contractors Association is a non-profit organization of members that work toward the common good of promoting the professional interest of one another. The Woodrick Diversity Learning Center at Grand Rapids Community College works to institutionalize diversity. The Jewish Federation of Grand Rapids supports the Jewish community in Kent and Ottawa counties, its congregations, schools, and Jews in need. Latina Network of West Michigan is bringing together Latina women in West Michigan for the purpose of building and developing personal and professional relationships in the community. Urban Core Collective is uplifting historically marginalized communities to a place of greater self-sufficiency by unifying communities of color in order to reduce the effects of systemic racism. Sisters Who Lead is championing the voices and inclusion of female leaders of color in West Michigan. La Mejor GR is an internet radio station that seeks to inform, engage, and entertain to make a positive difference in the lives of listeners. Their main goal is to be the leader in the Hispanic communications industry to nurture our listeners physically, mentally, and spiritually. The Holland community offers a wealth of diversity resources and initiatives. The Lakeshore Diversity Alliance works to dismantle barriers to ensure people of all ethnic backgrounds have equal access and opportunity to participate fully in the life of the community. The mission of LAUP is to empower Latinos to build a better community for all through supportive services. Out on the Lakeshore is a community center for LGBTQ youth and adults in the Holland area. The space, run by Holland Pride, has programming, social gatherings, and educational sessions. The Institute for Healing Racism-Muskegon was established September 15, 1998 to build a just community in which racism, prejudice, hate, and their effects are eliminated. Gun Lake Tribal Headquarters of the Match-E-Be-Nash-She-Wish Band of Pottawatomi Indians. Gun Lake Tribal Headquarters of the Match-E-Be-Nash-She-Wish Band of Pottawatomi Indians is just over the border in Allegan County. Idlewild African American Chamber of Commerce promotes existing local businesses and works to attract new ones to the Lake County. Lake Newaygo Branch of NAACP: Their mission is to ensure the political, educational, social, and economic equality of rights of all persons, and to eliminate race-based discrimination. Little River Band of Ottawa Indians is headquartered in Manistee and includes Lake County. Saginaw Chippewa Indian Tribe of Michigan is a federally recognized band of Chippewa (a.k.a. Ojibwe) Indians located in central Michigan.